SCD Group: Will Competition Push Associations & Nonprofits to Reinvent Themselves? Will Competition Push Associations & Nonprofits to Reinvent Themselves? "When you're finished changing, you're finished." Benjamin Franklin. I’ve been tracking association trends for some time and have discovered a growing number of organizations that are filling needs and niches existing associations apparently have missed. Some of the new discoveries gave me a flashback to 2008. Reading Clay Shirky’s (http://www.shirky.com/) powerful book Here Comes Everybody: The Power of Organizing without Organizations changed my perspectives about associations and other nonprofit organizations. I remember telling colleagues that the book’s contents represented either a huge opportunity or a burgeoning threat to the nonprofit community. At a session on the future of associations this summer, a well regarded association consultant challenged several association professionals who suggested associations faced increasing competition from nontraditional organizations. He said such organizations couldn’t sustain the structure needed to continue. Really? Based on what I’m seeing, I continue to disagree with that consultant’s assessment. Last summer, Becky Rasmussen (one of my former staff members) mentioned attending a publishers conference and being surprised that rather than focusing on publishing, the sessions and attendees were talking about conferences, seminars, webinars and “subscriber” benefits. Becky said “you would have thought I was attending a conference of association professionals, not publishers." • Competition from trade shows owned by publications or trade show companies is not new and, in some cases, associations have found ways to work cooperatively with these events. • Some publishing companies (in an effort to expand the platforms used to deliver their content) are expanding and providing content (education) that associations are not filling. For example, Farm Journal Media has expanded its platform to include a “Soybean College” that attracted 1,300 farmers and retailers. 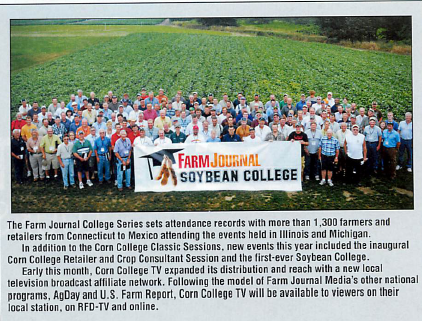 My question: why Farm Journal rather than the American Soybean Association? These four organizations share three common traits: they have members; they offer member benefits (content) and they are privately owned. I’m a member of two of them. I accidentally uncovered the other two while tracking nonprofit trends. Track trends influencing not only existing members and nonmembers but also your industry/profession and how Gen Xers and Gen Yers are getting information. Listen and lead. Follow what members and potential members are doing. Ensure that your association and nonprofits are out front ... don’t wait for others to fill the niches within your sphere of influence. Innovate and experiment. Don’t keep doing what you’ve always been doing. Seek new benefits & services, new ways, new offerings. Remember Franklin's words: don't stop changing. What do you think? How do you feel associations can continue to be relevant in today's environment?